To convert files of one format to another format so as to use files effectively in a different platform. Chemical file formats are formats used to represent chemical structure records and its associated data fields. The different file formats includes CML (Chemical Markup Language), SDF (Structural Data format) PDB (Protein Data Bank), SMILES (Simplified Molecular Input Line Entry Specifications), XYZ file format, Chemical file format etc. There are different chemical file formats available for representing molecules and are saved with their corresponding extension like “.pdb”, “.sdf”, “.xyz” etc. In real world environment, these different file formats occur in the different application areas like databases, visualizing programs, modelling or docking programs. Each of these programs represents their molecular data in their own file formats including 2D, 3D or symmetric representations (which may not be acceptable to all softwares). For example, AutoDock (docking software) accepts .pdb format while importing a molecule. In such cases one may need to convert files to their respective format for further docking procedures. OpenBabel is a free open source project designed to convert different molecular file formats. It helps to search, convert, analyze or store data which has a wide range of applications in the different fields of molecular modelling, computational chemistry etc. For a common user, it helps to apply chemistry aspect without worrying about the low level details of chemical information. It converts file formats used in cheminformatics including SMILES, MOL, MOL2 as input and computational chemistry packages like GAMESS, Gaussian, MOPAC etc. as output. It also converts crystallographic file formats (CIF, ShelX), reaction formats (MDLRXN), molecular dynamics and docking (AutoDock, Amber), 2D drawing packages (ChemDraw), 3D viewers (Chem3D, Molden) and chemical kinetics and thermodynamics (ChemKin, Thermo). To know more about the file formats, select the format of interest and click on the “?” button on the left side of selected format. Figure 1 and figure 2 show an example with SMILES format. OpenBabel is developed from OELib which is opensource software by OpenEye Scientific under the GPL (General Public License). Later they decided to rewrite OELib with the existing code into OpenBabel project. It have around 160,000 downloads, over 400 citations, about 40 software projects available as free to download. OpenBabel is available as free to download, which runs on Windows, Linux, Mac OSX as a cross platform. It is implemented in standard complaint C++ with its latest stable version OpenBabel 2.3.1. The two important components of OpenBabel are a command line utility which is used to translate between different file formats and a C++ library which contains file conversion codes and other utilities for various open source scientific software. It offers an “extensible plugin interface” for file formats, fingerprints, charge models, descriptors, and molecular mechanics force fields. The new file format which can be added should be in single C++ file and a trivial change to build files. The important features of OpenBabel are as follows. It manages around 110 chemical file formats with which one can read 82 formats and write 85 formats. It provide ready to use programs and a software package necessary for cheminformatics lab including file formats like SMILES, MOL, MOL2 as input and computational chemistry packages like GAMESS, Gaussian, MOPAC etc. as output. 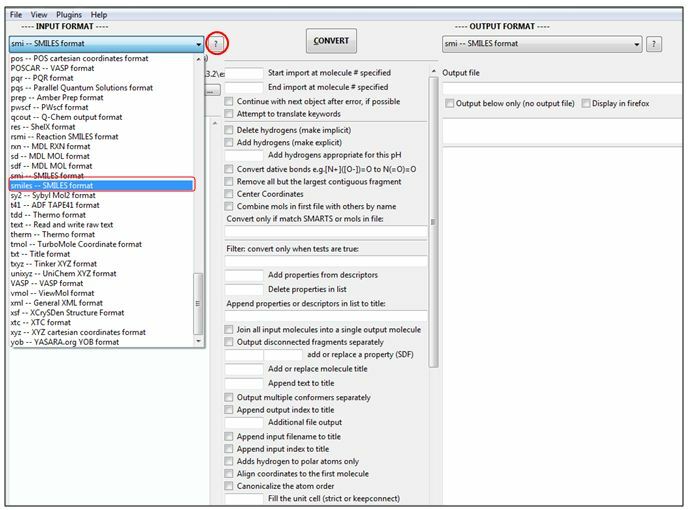 By using DayLight SMARTS pattern matching, molecular files can be searched and filtered. It also offers an extensible fingerprinting and molecular mechanics framework. It also offers wrappers for languages like Java, Perl, Python. The OpenBabel software package includes various other tools also. They are are command line programs which are described below. 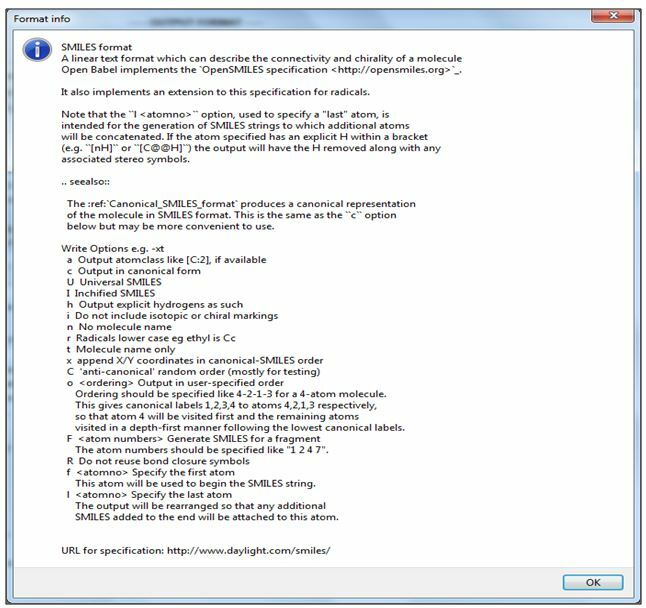 Babel: To convert molecular modelling data files. Obchiral: It prints the chirality information for the molecules. Obconformer: It is used to generate random conformers using Monte Carlo with MMFF94 as force field. Obenergy: It is used to calculate energy of the molecule. Obfit: It is used to superimpose two molecules by using SMARTS. Obgen: It si used to generate 3D coordinates for the molecule. Obgrep: It is used to find molecules inside multi-molecule database files using SMARTS. Obminimize: It is used to optimize, minimize and calculate the energy of the molecule. Obprobe: It is used in docking experiments to calculate MMFF94 energy by creating electrostatic probe grid. Obprop: It is used to print the standard properties of molecules in a file. Obrotamer: It is used to create random rotational isomers based on their rotating dihedral angles. Obrotate: It rotates the dihedral angle of molecules with their matching SMARTS pattern.